The Dangerous Boys are the D&D (Dungeons and Dragons) characters My Friends and I have been adventuring with regularly for a while now. I joined the others with my Character in early 2011 but the other guys had been running their characters for a little while already. I guess the Dangerous Boys (DB’s) are essentially just your garden variety escapism, Overblown caricatures we can live vicariously through and use to blow off steam. Adventuring with them is also a fabulous opportunity to get stuck into a few beers and some good whisky (Booze and D&D are a very complimentary combination). 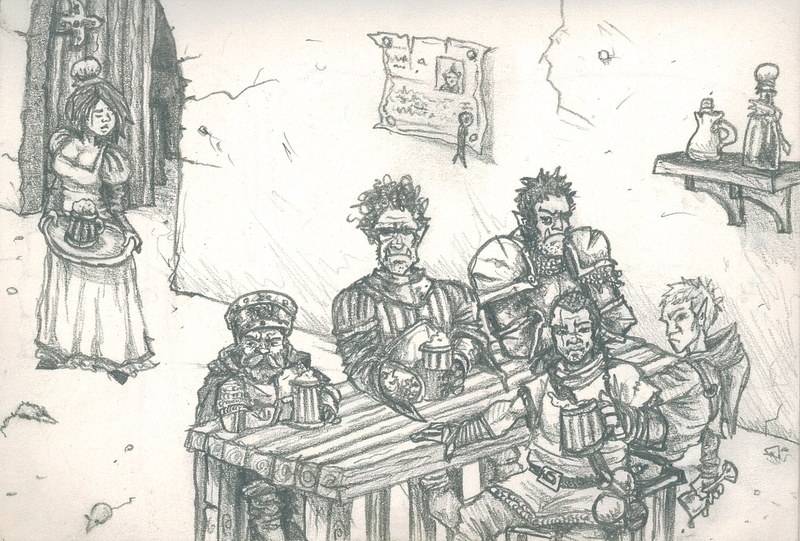 The Dangerous boys have been adventuring mainly in the ancient and morally corrupt city of Lankhmire (introduced to us and re-worked a little by a very dear old friend of mine who is of course one of the DB’s and the guy who got me back into D&D). It’s a bit like Zamora from Robert E. Howard’s Conan chronicles but with plenty of renaissance Florence thrown into the Mix. It’s a great open source gaming backdrop which gives us plenty of scope to get creative and get the most out of our characters and the Games as a whole. Anyway I started this blog so I could share with everybody all the DB related illustrations that came pouring out of me soon after joining the party (mostly during down time at work and mostly on post-it paper). The idea is to gradually piece together a sort of visual history of the dangerous boys using the drawings I’ve already done and the ones I will do in the future along with little descriptions of the events depicted (hopefully people other than the DB’s will enjoy some of the work). With this in mind I have compiled below an Illustrated summary of the members of the Dangerous boys and how they came about their infamous name. After being lured into a trap by the Afore mentioned Gnome the DB’s soon found themselves confronted by an enormous Barbarian “problem solver” who was of course having his mind controlled by the repugnant little gnome. This Gnome showed himself long enough to insult the boys, cop a throwing knife in the arse (curteousy of Billy I think), turn invisible and flee. 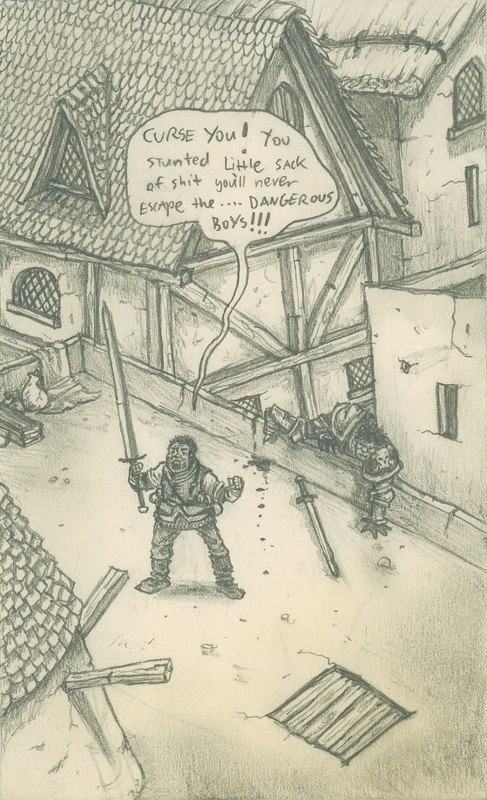 Billy and Garouk followed his blood trail all the way to the city rooftops were the trail went cold causing Billy (and his enraged player) to declare at full volume that “you’ll never escape….The Dangerous Boys”. Like all genuine nicknames it was lame yet apt that it instantly stuck (we even have a logo and T-shirts now). 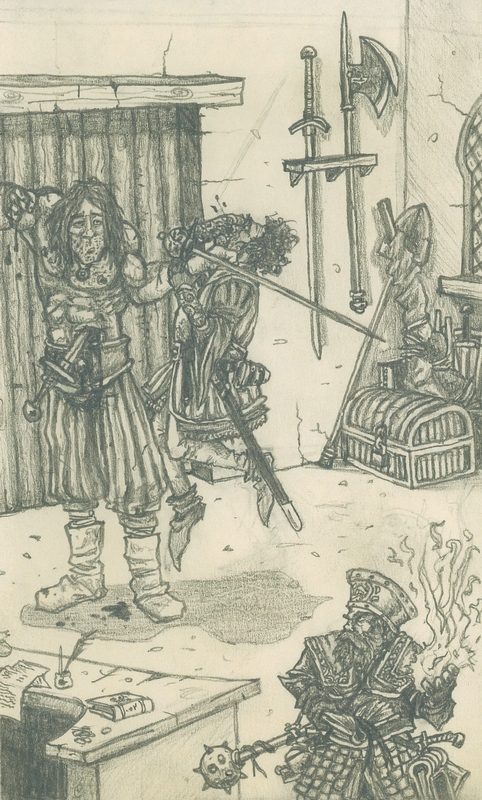 Of course while Billy and Garouk were being dramatic on the Seady rooftops of Lankhmire Garibaldi and Grim were battling for their very lives against the Enormous Mind controlled Barbarian slave the Gnome had left behind as he made his escape. Garibaldi Foolishly but very characteristically claimed he could take out the Barbarian easily and Billy and Garouk should give chase to the impertenant Heameroid of a Gnome that had been responsible for all our headaches that day. Luckily Grim stayed behind with his book of healing spells because Garibaldi was comotosed within an inch of his life three times during the ensuing combat and had to be quickly healed over and over again before he finally slew his enemy. 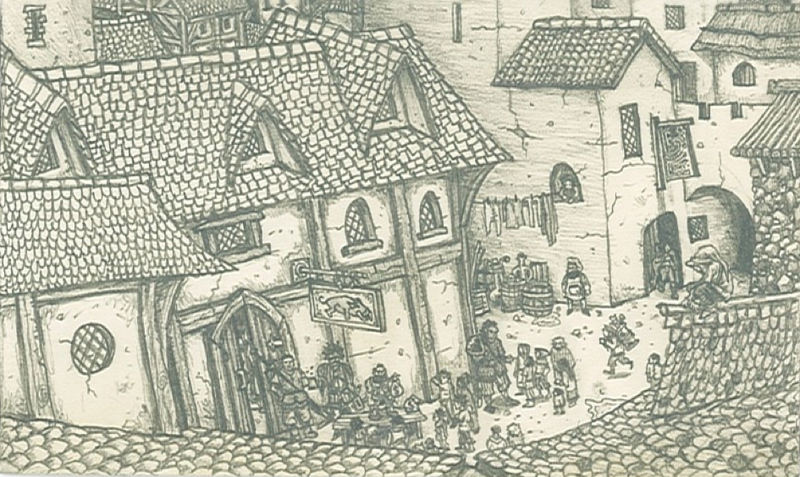 To see more Illustrations and their associated stories please refer to the Blogs. Just found your blog, your illustrations look pretty cool. I’ve recently moved overseas from Melbourne & reading your stuff about roleplaying with your buddies makes me all misty eyed….and you are indeed correct, beer and roleplaying are very complimentary!